Specna Arms SA-C07 CORE (Half Tan). Specna Arms meets the expectations of clients by presenting the CORE™ line of products - an exceptional series of replicas that introduces a new quality to the market. 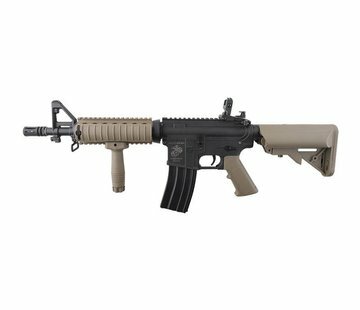 An attractive price in combination with an innovative spring change system as well as high-quality materials make this replica suitable for beginners and seasoned airsoft players alike. The receiver, stock slide and an SF stock that holds the battery, as well as the pistol grip, were made from nylon reinforced polymer. Remaining components such as the barrel, KeyMod handguard, flash hider, enlarged charging handle and tactical sling swivels were made of metal (parts made of steel include the screws, pins, shell ejection window and mock bolt carrier). The receiver bears markings and a serial number. The gearbox contains 8 mm slide bearings as well as shimmed steel gears based on them. The system is secured with four anti-reversal latches. A light, made of a polycarbonate polymer piston is equipped with a full steel strip, in order to increase its durability. Also, implemented were a type 1 cylinder and a steel circuit-breaker, as well as a precise rotary Hop-Up chamber. The durability of parts allows for the cooperation with M140 springs. 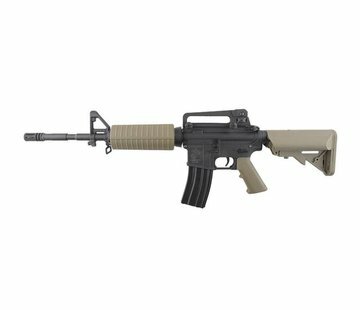 The replica is equipped with a 22 mm top RIS rail, Keymod handguard and an adjustable stock. The top RIS rail features flip-up iron sights that do not collide with optoelectronic aiming devices. Due to the extendable stock with an anti-slip stock pad, it is possible to adapt the replica’s length to the body type and preferences of the User. The silencer is based on a 14 mm left-handed thread.